What does a house represent? It’s first and foremost a place to live and a form of protection against the weather. Depending on where you live, your house will keep out the cold, heat, wind or wet climate. Historically, homes were built with whatever material was nearby. Once this was turf and mud, then straw, timber, brick and even snow. The basic needs of the house may be the same everywhere, but the way it’s constructed reflects the climate and society of the time. Is the environment forcing change? A study called Habitat: Vernacular Architecture for a Changing Planet addresses the question of architecture versus the environment. The main thrust of the argument put forward in the research is that, as environmental problems become more imminent and urgent, we should learn from the way builders around the world create architecture in harmony with the surrounding ecosystem. The study organises examples of architecture by five different climate types: polar, continental, dry, temperate and tropical. While there appears an assumption that our ancestors knew best, in terms of building for our environment, the study does temper this with the idea that we should absorb these historical ways of building into modern architecture. Examples include a cob building in Devon, made from a mix of mud and straw, bamboo houses in Vietnam and homes constructed from earth in Mali. 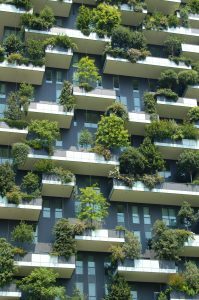 By looking at the unexpected use of our local materials and how they create dwellings in harmony with our environment, the study shows how beautiful buildings are still possible while using practical materials. Also included in the wide-ranging research are suggestions and possibilities for how we could update these ancient techniques to work more in harmony with our environment. Many forward-thinking architects are actively working on ways we can better harness the natural world through our homes. For example, an architect called Michael Reynolds believes that saving the world will come through the construction of self-regulating and self-heating houses. Instead of the current focus on ‘offsetting carbon footprints’, which although worthy, isn’t likely to help us tackle climate change in any meaningful way, Reynolds believes that our entire approach to building and the materials we use should change. Earthships are an example of a theory made possible through architecture. Reynolds founded his company, Earthship Biotecture in New Mexico back in the 1970s. He was focused on creating a home that would be sustainable, able to rely on natural energy sources and be ‘off grid’. His vision transformed into U-shaped homes made from earth-filled tires. The thermal mass construction technique allows them to self-regulate the temperature inside. With a natural ventilation system and no reliance on public utilities and fossil fuels, they are a truly different way to live. Electricity comes from wind and solar power. Water comes from rain and melted snow and can be used four times. Sewage is treated on site using botanical planters. Temperature is controlled using thermal mass. Food can be grown inside and outside. They can be built in any climate, anywhere in the world and are mostly self-sustaining. Whether a mass move towards seriously sustainable architecture will happen any time soon remains to be seen. However, it’s clear there are many alternative ways of building the homes we live in. This entry was posted in Residential and tagged Architecture, Design, Fortitudo Property, Property, Richard Carr by Richard Carr. Bookmark the permalink.